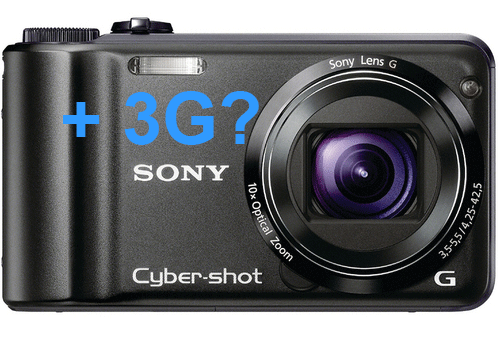 Digital Home Thoughts: Sony Rumoured to be Working on 3G-enabled Digital Camera? Sony Rumoured to be Working on 3G-enabled Digital Camera? "Gdgt reported a rumor that Sony is working on a digital camera with integrated 3G connection. This will not be another smart phone, but rather a Cybershot camera that will allow instant upload of images online via an integrated 3G connection." I have mentioned that I would like to see a connected camera in 2011, and Sony (unfortunately in my case) might just be the first to the market with one. I am wondering how well it will sell once it comes out: Will it be taken hostage by tyrannical North American carriers, just like every other device that sports a cellular radio? I hope not, because this is an area where cameras can stand to innovate, and having a non-traditional obstacle is not going to help things.